The Yukon government has designated the A.J. Goddard, a Gold Rush-era steamboat found on the bottom of a lake last year, a historic site. This means the shipwrecked stern wheeler, which remains almost intact at the bottom of Lake Laberge, will be protected from damage or harm by people, according to Yukon government officials. 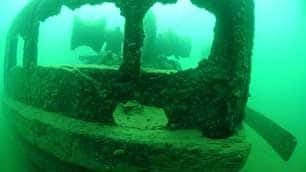 "We're delighted to see the designation because it shows that not only are shipwrecks important pieces of the past, but that they're also important resources," James Delgado, the Texas-based president of the Institute of Nautical Archeology, told CBC News. Launched during the Klondike Gold Rush in 1898 to carry miners and supplies, the A.J. Goddard vanished in Lake Laberge, north of Whitehorse, in a storm Oct. 22, 1901. Three crew members drowned and two survived. An archeological team, which included Delgado and Doug Davidge of the Yukon Transportation Museum, found the steamboat with its hull intact and many of the crew's belongings preserved. Delgado said he remembers seeing the ship's boiler door propped open, and clothes and shoes were still sitting on the deck of the sternwheeler. "In this case, this little mini-museum helps bring that Gold Rush to life," he said.